I was just reading some of the PPC Mac Owners Group comments over at MyAppleSpace where they had begun discussing their favorite PPC models. 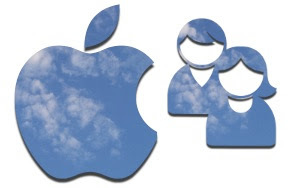 MyAppleSpace.com is a Ning group with around a thousand users now (and growing, hint, hint). It's just the kind of place I can really feel comfortable and ultra geeky and not worry what others will think of me. I think, or so they tell me over there, that I fit right in. If you're a Mac user and you haven't checked it out yet, you really should. So, I was considering responding to one of the comments and sharing all the specs of my own machines and it got me thinking and even more excited about the upcoming announcements from Apple tomorrow on what could be new laptops in their product line. As I was drafting my post and sharing personal thoughts about my experiences, it made me nostalgic thinking about how far Apple has come in their development over the years. It's hard to believe that I've been a Mac user now for close to twenty years! (about 18 to be exact) Man, I feel old! I can't wait to see what Steve will unveil tomorrow. I can't wait to twitter and chat and read live blogs about it all. There is much speculation about a significant price drop to new notebooks and I really hope it's true. Some of my friends and family members think I'm nuts for being so excited about this, but they just don't understand. Some people have cars and boats and other hobbies. This is mine. Maybe this will help you understand a little better. Imagine if you will the droplet effect as we fade to black and white using a moiré pattern in 133 dpi. I had been using Macs exclusively for commercial art in trade school since 1990 and continued to use them working in the field of advertising as a typesetter for a few years. Back then, the Shift key was your number one troubleshooting resource. Feeling unfulfilled as a pre-press technician, I decided to go back to school for my BFA so I could become a designer. The first Mac I ever *bought* was in 1997 (I think). I was a communications design student at university and got sick of having to fight my way in to the Mac lab on campus each night to work on projects. I decided it was time to get my own Mac and spend my late nights at home instead of the lab. (Oddly enough, I believe I'm STILL paying off that Mac since it got financed in with the rest of my student loan debt.) Just the desktop alone cost $1900.00 back then through the university bookstore and that doesn't include the monitor, printer and UMAX scanner I purchased along with it. Oh, and also the RIP software I had to install so I could print postscript using an inkjet printer since I was developing some mad skillz at silhouetting objects in Photoshop and needed to be able to print EPS with clipping paths. Oh yeah, and also the design software: Quark XPress, Adobe Photoshop and Illustrator. I also bought Painter before Macromedia bought it. I don't even want to know how much it all really cost me (including interest compounded). I'll never forget that machine though. It was my baby. I knew all the sounds it made and could tell when there might be trouble or how long of a break I could take while waiting for it to boot up, connect and be ready to go. I got brave and upgraded the RAM and PCI slots myself to give it some USB ports. I remember one time I had an issue with the "personality card" and had to snap it back into place because the startup chime wasn't sounding. That case was NOT one of their better designs, I must say. The card would never stay in place. The modem also got fried at one point too. Good thing I finally got high speed internet via ethernet and didn't need it. To this day, the sounds of a fax machine make me cringe. Luckily I don't hear it very often anymore! I suppose you're wondering what model it is? I'll give you a hint. Big, red, hairy monster. Nope, not me after pulling another all-nighter. This PPC G3 now resides in my Dad's attic out in PA because I can not bear to throw it away. Someday I'll make a planter out of it or something, but I'll never part with it. There is even an LC575 up there keeping it company. One of these days I'll find something to do with them. Some people collect stray cats. I collect stray Macs. 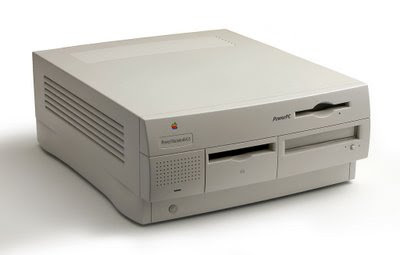 I think there are a lot of Mac users out there who are nostalgic about their machines and the memories and projects they've created with them. All of the creating, organizing, problem solving, learning, the "what do you mean I just lost the last hour's worth of work because I forgot to save?!!" "curse you %&#@ing bomb icon from hell!" I think many people have develop OCD and ticks because of it. Apple-S, Apple-S, Apple-S - it is your friend, right next to Apple-Z...they are bodily functions equivalent to blinking now – for me anyhow. When the hard drive died in the Quicksilver G4 after 5 years of heavy use and barely ever being shut down, a friend came over and helped me replace it with one we pulled out of another machine scrapped for parts and not yet in use. Using my backup CDs, I was back up and running within 24 hours. 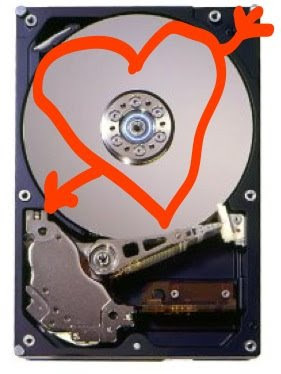 Thing is, I still can't bear to part with the original hard drive, not only because I can still get it to boot up and connect externally with an IDE to USB converter, but because, well, I met my husband on that hard drive. My old hard drive may be a hunk of metal and moving parts, but it's our little reminder of how far we've come in our relationship. From blinking cursors to beating hearts. Ok, you can go puke now. It's ok. I know I'm a geek and I'm ok with that. A nyhow, those are the two PPCs I've ever personally owned and interacted with in a loving manner. It's my story and I'm stickin to it! We also have a Tangerine PPC G3 iMac with built in Airport that our son's uncle found and gave to us for his godson to play with. I have it all set up as a play toy for him in his bedroom. He loves it. He's only 2 and can already log into his own little account and play AlphaBaby by himself. In addition to those three working Macs used in our home, we also have a couple of other legacy Machines laying around in the garage for parts. There is a Grape tray load iMac and something like an LC575 or close to it. It's fun to boot that thing up and watch the twisted After Dark screen savers. 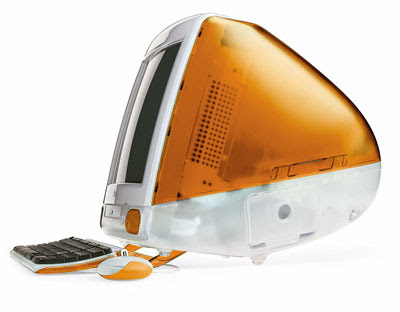 One of these days, I'd like to put together the little old Grape slot-load iMac and set it up in his lab. The last modification I'd make to it though is I'd like to paint all the purple parts black so it not only like the more modern black and aluminum theme, but it will coordinate with his black slate table tops as well. 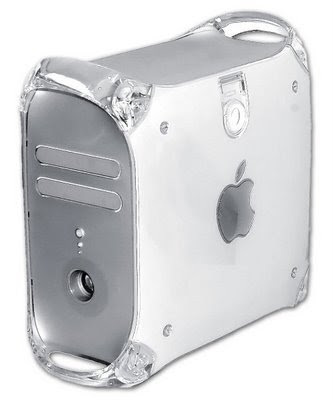 So, yeah, I guess you could say I'm a bit of an Apple fangirl because of the many fond memories I have of using Apple's PowerPC models (and earlier). I'll always be excited to partake in the progress of this revolutionary company as it's proven nothing but a worthy investment to me. While it's true both Mac and Windows' operating systems run on "PCs" using Intel as opposed to PowerPC processing, the difference is that the Windows PC is a more of a Public Computer than personal, while the Mac, to me, truly is and will always be the Powerful, Personable Computer. Hi, I'm a Mac and I'm personable. 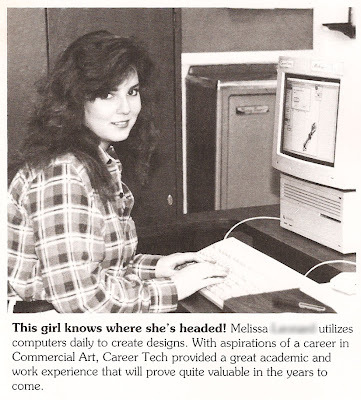 Geek cred to whoever can identify the Mac I'm sitting at in the yearbook photo above! Wow!! You really are a Mac lover! I just discovered the Apple World, and I had NO idea what I was missing all of these years without one! This is a great read -- thanks for sharing! I, too miss After Dark. I had the cool 'what the cool kids would call a mash-up' ones (I think that's the one you describe: I personally liked "Mowing Cats". I also had the Looney Tunes one where it would reenact classic Warner Bros. toons of my day. I miss that kind of stuff. BTW, who in their right (or left) mind signed off on the new slim Al++ keyboard w/o the Apple logo on the command / splat key? Apple-S, Apple-S has lost it’s meaning even though I still Apple-S out of habit. I dunno -- as a long time Mac user, it's nice to tell people to use the 'command' key, and not have to go into a 10-minute lecture on what that cloverleaf thing is. A change for the better, IMHO.